Pecans, finely chopped 2 Tbsp. Soy margarine, melted 2 Tbsp. Silken tofu 1 lb. 8 oz. Grated lemon peel 1 Tb. 1. Combine vanilla wafer crumbs, pecans and margarine; mix well. Press mixture into bottom of 9-inch springform pan. Bake at 375°F about 8 minutes or until golden brown. Cool on wire rack. 2. In mixer bowl, beat tofu until smooth. Add cream cheese, sugar, flour, lemon peel and vanilla; mix until completely blended. 3. Beat in eggs and whites, one at a time; mix well. Pour filling over crust. 4. Bake at 375°F 50 to 60 minutes or until filling is set and edges of top are lightly browned. Cool on wire rack and refrigerate overnight to cool completely. 5. 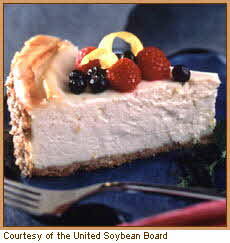 Remove ring and press chopped pecans into sides of cheesecake, if desired. Cut into 12 portions, dipping knife blade in hot water between each slice. 6. Serve 1 to 2 ounces berries over each portion.